This review refers to the 2003 edition of this book. If you are looking for information on the original "collector's edition" of The Tribal Bible, which was published in 1999, please see the separate review for that version elsewhere on this web site. The Tribal Bible is Kajira Djoumahna's revised edition of her book about U.S. tribal-style belly dance. Kajira particularly emphasizes the subset known as American Tribal Style (ATS), which consists of group improvisation pioneered by Carolena Nericcio of FatChanceBellyDance. However, she includes information that will be interesting and helpful to people who embrace other flavors of tribal as well, including interviews with Suhaila Salimpour, John Compton, and many others. The Tribal Bible is Kajira Djoumahna's second edition of her book about U.S. tribal-style belly dance. Kajira particularly emphasizes the subset known as American Tribal Style (ATS), which consists of group improvisation pioneered by Carolena Nericcio of FatChanceBellyDance. However, she includes information that will be interesting and helpful to people who embrace other flavors of tribal as well, including interviews with Suhaila Salimpour, John Compton, and many others. In this 300-page volume, Kajira offers extremely detailed information about the many aspects of tribal style belly dance. The book opens, appropriately, with a definition of Tribal belly dance, then moves into a historical view of its origins. 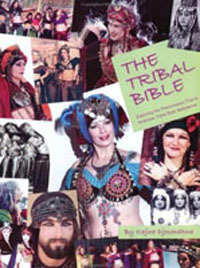 This includes interviews with Suhaila Salimpour (whose mother, Jamila, founded the troupe Bal Anat which pioneered this style), Carolena Nericcio (the director of FatChanceBellyDance and founder of the subset of Tribal known today as American Tribal Style, and Masha Archer, the teacher from whom Carolena learned to belly dance. Chapter 2 covers other offshoots of Bal Anat, who took Jamila Salimpour's concept into their own directions. It begins with an extensive interview with John Compton, who together with Rita Alderucci is the director of the troupe Hahbi 'Ru. A former member of Bal Anat from the 1970's, John speaks of what it was like to be the first male dancer in the troupe and offers insight into the experience of being a member of this influential dance company. He also talks about Hahbi 'Ru, and offers tips for softening the stiff new assuit currently being made in Egypt. The chapter closes with interviews with other former members of Bal Anat, Yasmela and Jenia, who took the Bal Anat concept into their own artistic directions. In Chapter 3, Kajira moves on to profiling the "descendants" of FatChance. She includes comments from Paulette Rees-Denis (director of Gypsy Caravan), Jill Parker (Ultra Gypsy), and other leaders in the style. Most of these are presented in the form of correspondence that Kajira received from them, rather than as interviews. The costuming chapter is my favorite part of the book because of Kajira's extensive research and meticulous attention to detail. It contains many color photos, both of modern-day Tribal belly dancers, and also of historical dancers from the Middle East and North Africa. This helps immensely in understanding the ethnic influences that inspired many of the costume elements used in today's Tribal style. The jewelry section of this chapter shows illustrations of many ethnic pieces with information about where they are from. There is also a section on makeup, including photos of North African people with facial tattoos and diagrams with ideas for drawing on your own. While the chapter does include some how-to's (wrapping a turban, making a pop-on headdress, making a base for a tassel belt, using henna), the bulk of the chapter focuses on describing the historical garments which served as the models for today's Tribal costuming. I feel this emphasis was exactly right, because there are other books available in the market focused on how-to's. Chapter 5 talks about how to present this style of dance. It begins with a description of the correct Tribal posture, then talks about the use of foreground dancers, chorus, and positioning of these groups. Next, Kajira describes how to do various moves including figure 8 variations, slow turns, and several others. Although I personally find it challenging to learn dance moves from printed text alone, these descriptions may be helpful in better understanding how to do moves seen on video or taught in class. The music chapter suggests some artists, includes an article written by Natasya on rhythms, offers information on playing finger cymbals and Turkish spoons, and tips for working with live musicians. Chapter 7 is Kajira's own response to the frequent practice among many Tribal belly dance troupes of incorporating the word "Gypsy" into their troupe name. Since many such belly dancers know little or nothing about the Roma, Kajira uses this chapter to provide some information about this ethnic group and she encourages respect for their cultural identity. It includes pieces written by Elizabeth "Artemis" Mourat and other contributors. Although I agree with the point Kajira is trying to make with this chapter, I find that it drags on too long for my taste and has too much flavor of proselytizing. Chapter 8, titled, "Imitation, Innovation, & Ethnics", offers thoughts by Kajira and others for those who would like to jump on the Tribal bandwagon. It speaks of the importance of knowing your sources, honoring the forerunners who inspired you, and learning the foundations thoroughly before adding your own innovations. Chapter 9, "Dance & Ritual", puts Kajira's own very personal spin on Tribal dance. She explores the use of dance in ceremonial ritual, including some information about Middle Eastern movement rituals such as the Guedra and zikr, then explores how modern dancers in the West might bring dance and ritual together. I was a little surprised to see this chapter in this book, because most Tribal dancers I know do not see ritual as part of their dance experience. However, for those who wish to bring together their dance with their spiritual sides, as Kajira does, the chapter offers historical background and ideas for how to proceed. In its final chapter, Kajira presents the text of correspondence she has had with various additional dancers regarding what the Tribal style means to them. At the end, Kajira offers an extensive resource guide identifying music, books, workshop instructors, and other items that she has found valuable in her journey as a dancer. You are passionate about all flavors of the tribal style of belly dance. You aspire to teach some flavor of tribal style and want to represent the style accurately. You are confused about some aspects of tribal style and would like to gain input from not only Kajira but also the leaders of this style that she interviewed. You admire many of the dancers who were early leaders in the tribal style of belly dance, such as Carolena Nericcio, Paulette Rees-Denis, John Compton, and others, and you'd like to hear what they have to say. You're expecting information about tribal fusion, a style which didn't become widespread until after this edition of the book was written. You feel you already know everything you need to know about the tribal sub-genre of belly dance. You have absolutely no interest in the tribal flavors of belly dance that originated in the U.S.
Kajira has packed a great deal of information into this book. During the three-year interval between sellout of her 1999 first edition and release of this greatly expanded second edition, I often wondered what was taking so long. However, once I saw the finished product, I understood, and now I'm quite impressed that it took only three years. The amount of research that went into creating this book is massive, and I appreciate it very much! Kajira attempts to cover every topic with as much information as possible, and she is diligent about attributing her sources. Even though I've been part of the belly dance scene for over two decades, and even though I'm reasonably knowledgeable about many of the topics included in this book, I still learned a great deal from reading it. Kajira attempts to represent many points of view through including interviews, reprints of published articles, and correspondence with fellow dancers. She emphasizes her personal definition of Tribal as matching the FatChance model of strong posture and group improvisation, but acknowledges that other people see it differently. The book contains extensive illustrations, including some in color. As someone who loves ethnic clothing and jewelry, I very much appreciate the extensive historical photographs and explanations of these items in the costuming chapter. There are also many photos of FatChance and other Tribal troupes around the world. These illustrations make the book visually pleasing, and Kajira faithfully places an informative caption on each. I appreciate Kajira's many efforts throughout the book to honor the cultures of the Middle East, Asia, and North Africa who have provided inspiration to Tribal dancers for music, costuming, and dance moves. Natasya Katsikaris' article, "The Importance of Knowing & Honoring Our Cultural Sources" offers an excellent perspective on this. This is one of the rare belly dance books that is perfect bound (so you can read its title on the spine) instead of spiral bound. I much appreciate the extra effort and investment Kajira made to do this! After I finished my initial reading of the book, I found myself wanting to refer back to certain sections to review them. Unfortunately, there is no index, so it can be challenging finding the desired page! The table of contents contains the major chapter headings, but since there is no index I found myself wishing for the subheadings inside the chapters to be included as part of the table of contents. A 300-page non-fiction book with a cursory table of contents and no-index is a big unwieldy. Although the many contributions enrich the book by offering additional facts and viewpoints, they make for a somewhat irregular writing style and presentation of information. At times, The Tribal Bible feels more like a collection of articles rather than a cohesive book. This is only a minor point, however, because I do see the value of the information in those pieces. I became a bit weary of the large number of "what Tribal means to me" testimonials, mostly because of the large amount of overlap. There's only so much proselytizing about "why this dance is wonderful" that a person can endure unless you happen to share the passion. I don't dispute people's reasons for appreciating Tribal, but I think Kajira should have been more selective and omitted some of the redundancy. At several times, I found myself wishing that some of the pictures would have been reproduced in a larger size. This was particularly true of several of the historic pictures of North Africa dancers. It would have been nice to have a clearer view of their costumes and facial tattoos. This book describes the foundation upon which tribal-style belly dance as we know it today was built. Unfortunately, much of today's implementation of tribal has wandered far from the roots described in this book, sort of like a game of "telephone" where each teacher has lost or modified something when transmitting the style to her students. I would urge anybody aspiring to teach this dance style today to buy or borrow a copy of this book and read it, from beginning to end, to educate herself in the foundation upon which this dance style was built. And after finishing it, I would urge her to read it two more times. I've seen a lot of well-intentioned presentation of tribal style that is lacking in some of the important basics described in this book. When I think about the work and study Kajira performed to produce this book (researching the facts, collecting and scanning the illustrations, and learning how to publish), I am very impressed. It has been a massive undertaking for her, and she has worked hard to present a high-quality result. For dancers of other styles of belly dance, I think this book could be a useful tool for understanding their tribal-style cousins. Kajira sent me a complimentary copy of this book to use for the review. Kajira and I originally met over the Internet around 1997, and over the years we have become friends. I respect her on many levels: as a dancer, an event sponsor, and a writer.